It wasn't really a competition. Which is a good thing, as we are bacon-loving people, and we pretty much devour it all. But when the traditional Coffee & Brown Sugar Bacon came to the table on Christmas Morning, it had company. We had given son-in-law a smoker last Christmas, and since we'd missed his smoked turkey at Thanksgiving, I think he was making it up to us by curing and smoking some Christmas bacon. Oh yeah, he's handy to have around, and let's just add that we enjoy his edible experiments. 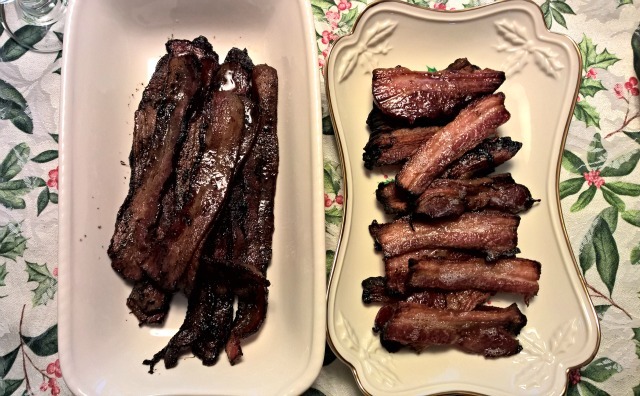 So in the photo, the coffee bacon is on the left, the home-smoked on the right. They obviously are quite different, but both deemed very very good. Really, what's more to say than that? yum!! one problem with France: no bacon. France has no bacon??? Shame on France! Bacon is a food group as far as I'm concerned!!! Lucky you with a son in law to smoke up some bacon for you!!! As a Type 2 diabetic, there is no doubt you hear a lot about carbohydrates and how and when to eat them. But not all carbohydrates are created equal. There are three basic types of carbohydrates - sugars, starches, and fibers. Sugars are also called simple carbohydrates, while starches and fibers are considered complex carbohydrates. Each of these types of carbohydrate act differently in your body. My husband has a monster of a smoker and we use it frequently throughout the year, even when it is snowing outdoors. We've not tried smoking bacon. Sounds de-lish. I've never met a bacon I didn't like.